Bishop John Chen, who died at 96 years of age, spent several years in prison. During the Cultural Revolution he worked as a farmer. Rehabilitated, he resumed relations with the Holy See and became a major formator of priests and nuns. Yibin (AsiaNews) - Elderly Bishop John Chen Shizhong of Yibin (Sichuan) died yesterday, Dec. 16, in a hospital in Yibin at the age of 96. His funeral Mass and memorial service will take place at the Cathedral. Coadjutor Bishop Luo Xuegang, 48, who was ordained by Bishop Chen a year ago, now succeeded as ordinary of Yibin. He will preside the funeral liturgy. 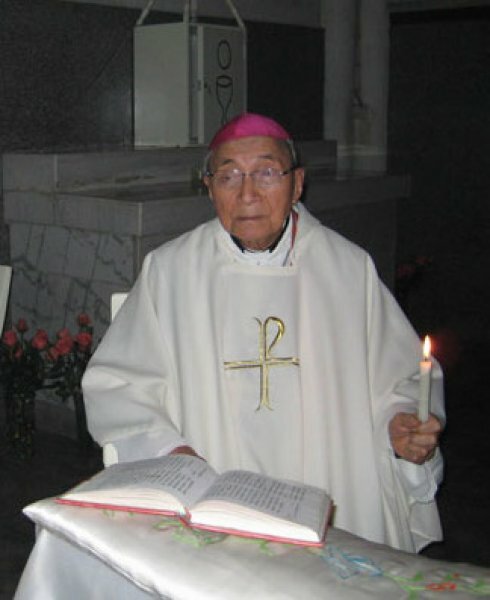 Bishop Chen's body will be buried at a Church graveyard afterwards. Both bishops are recognized by the Holy See and the Chinese government. Bishop Chen is well-remembered as a formator of priests and sisters in the region, a priest in Yibin diocese told AsiaNews. The faithful and Catholics from other dioceses of Sichuan have arrived at the Yibin cathedral to pay tribute to the late bishop since yesterday. They offered Masses, prayers and recitation of rosaries. Led by Bishop Luo, Yibin diocese has 9 priests, 7 sisters, one seminarian and a flock of 40,000 Catholics. Born into a Catholic family in 1917, Bishop Chen entered the minor seminary in Yibin in 1927, and studied philosophy and theology at Annunciation Seminary in 1938. He was ordained a priest in 1947 and served as a parish pastor. He was imprisoned for being a priest during 1950s and Cultural Revolution (1966-76). In 1981, he was rehabilitated and returned to the church in Yibin. He was ordained bishop of Yibin on June 14, 1985. He had become the 8th bishop of Yibin diocese, who was the first Chinese bishop of the diocese. Later, he was recognized by the Holy See. Since 1983, he was involved in the preparation for the opening of Southwestern Seminary, based in Chengdu. In 1988, he became the rector of the regional seminary and began to train up sisters in Yibin diocese. In 1989, he returned to Yibin diocese. During his 27-year episcopacy, he had ordained more than 40 priests in the five dioceses of Sichuan, and took part in ordination of five bishops, including that of Bishop Luo on November 30, 2011. An illegitimate bishop of Leshan (Sichuan), Paul Lei Shiyin, was present at the liturgy.